Following the success of his 2013 solo exhibition, “Temporal,” Modified Arts is proud to present “Lost in Transition,” the latest collection of solo paintings and works on paper from Phoenix-based artist Jonathan Howard. Broadly, Howard’s works feature a somewhat abstracted view of urban landscapes, both thriving and decaying. 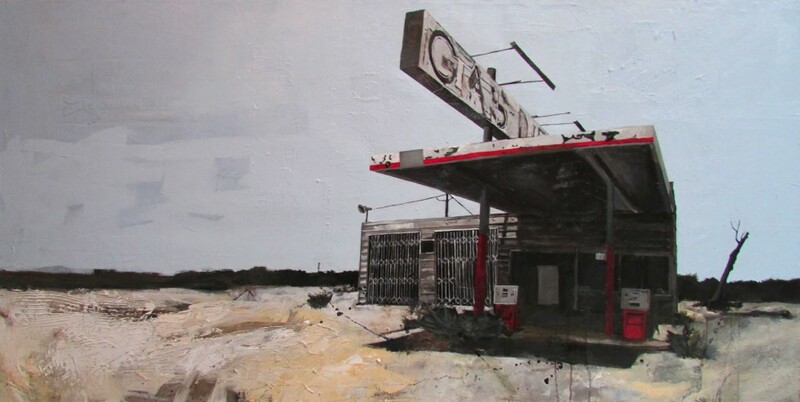 Drawing from Surrealist and Ashcan influences, and his own existentialist philosophy, the pieces vacillate between bustling city streets with historic architecture, and desolate roadside decay. In his canvas works, close inspection reveals layers of collage combining old newsprint and magazines laying the foundation for a vibrant but graying painting. Conversely, Howard’s drawings remain sparse, with pencil outlines often left unfilled, and light shading to provide perspective and subtle contrast. Since graduating from Arizona State University with a BFA in painting in 1997, Howard has exhibited extensively throughout Arizona, and was represented by the pioneering Paulina Miller Gallery through the mid 2000s. Currently, his paintings are in rotation at Sedona’s acclaimed Lanning Gallery. My work reflects the fragility and ephemeral nature of reality while documenting the passage of time. It is a weave of written language, visual iconography, figurative elements, and non-representational abstraction. The intention is to reflect the multifaceted nature of reality. Reality is defined as the interaction of the individual in relation to his or her environment, both of which are changing every second. Every living moment, we think and interpret events as they occur; we are influenced by memories or mental pre-dispositions to the extent that no single event exists completely in and of itself. I address this perception of reality within my art.